Thumbprint cookies are my little munchkin's favorite sweet treats. I took the girls to our neighborhood park this afternoon and I brought along a box filled with the fun-looking thumbprint-shaped sablé cookies. The other fun thing about the cookies is that it's easy to mix and match the flavors and add fun colors. I have flavored these cookies with cardamom, star anise seeds, mango and even durian! 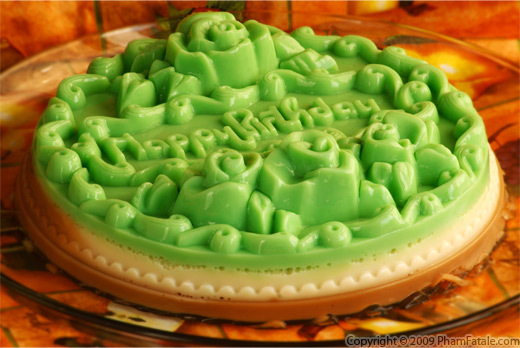 Today I made a combination of pandan and dark chocolate with a fancy little touch of vanilla. Needless to say, everyone was very tired and hungry after jumping up and down on the monkey bars and on the swings. All the cookies were gone, so it's a good thing I took pictures beforehand so that I can share them with you. Using a handheld mixer, whisk the egg yolk with 1/4 cup of powdered sugar until you get a pale, yellow foam. Add the vanilla extract. In a bowl, combine the flour, salt and baking soda. Sift all the dry ingredients. Cream 8 tablespoons of butter with the remaining powdered sugar (whisk using the handheld mixer to get as much air as possible into the butter). Add the egg mixture and the dry ingredients. Mix with your fingers until the cookie dough is formed. Add the pandan paste. Do NOT over-mix. Transfer the dough to a bowl. Plastic wrap it and place it in the refrigerator for at least 20 minutes. For the dark chocolate and vanilla chips, use or make a double boiler. Place a pot filled with hot water, topped with a piece of cloth so the bowl does not move and splatter any water, and place a stainless-steel bowl filled with the dark chocolate chips on top. Melt the chocolate chips with 3 tablespoons of butter, 1-1/2 tablespoons of heavy cream and 1-1/2 teaspoons of corn syrup. Repeat the same procedure with the vanilla chips with only 1 tablespoon of butter, 1/2 tablespoon of heavy cream and 1/2 teaspoon of corn syrup for each remaining filling. Set aside. Shape the cookie dough into 20 1-inch diameter balls. Place them on a baking tray lined with a silicone mat or a sheet of parchment paper. Bake the cookies for 10 minutes at 350°F. Open the oven. Press the center of the cookie using a melon baller or any small spoon. Bake for another 8 minutes. Remove from the oven and let them cool down completely to room temperature before taking them off the cookie sheets. They will harden and get firm as they cool down. Spoon about 1/4 teaspoon of dark chocolate filling in each thumbprint. Using a chopstick, drop in a little vanilla filling and immediately swirl the filling in a pretty design using a toothpick. Let the filling set until firm. 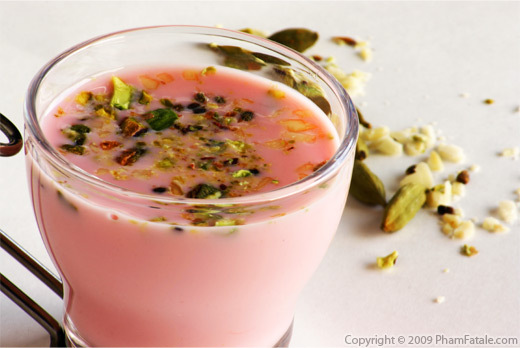 Enjoy with a tall glass of sharbat (Indian milk drink, scroll down for the picture). Thermos insulated bottles are very convenient when we go to the park. Make sure to press the cookies half-way through the baking time to get nice fault lines on the edge of the cookies. My 9-year-old sister-in-law is allergic to eggs, so we tried the same recipe without the egg yolk. Just mix all the powdered sugar into the butter. The verdict is that it's feasible but the cookie is more crumbly and far less cohesive. The egg yolk is a powerful binding agent. For other allergy reasons, I did not decorate the thumbprint cookies with nuts. You can coat the cookies in milk, then garnish the outside ring of the cookies with 1/2 cup finely chopped pistachios or any other nuts you like, right before placing in the oven. I used Guittard chocolate chips and vanilla chips for the ganache. I buy them at a local store, called the Milk Pail Market. The address is 2585 California Street, Mountain View, CA 94040. Make crème brulées or chocolate pot de crèmes with the rest of the chocolate chips. For the double boiler, I always like to add a little kitchen towel underneath the chocolate filled bowl. That way the bowl won't jiggle and there won't be any splatter of water in your chocolate. If the chocolate hardens, place the bowl back on the double boiler. I added some heavy cream to the chocolate to make the mixture smoother and more glossy. You can add any other dairy liquid, such as regular milk, or even omit this part if you want a thicker texture. You can also store the thumbprint cookie dough up to 3 months in your freezer for last-minute surprise guests. 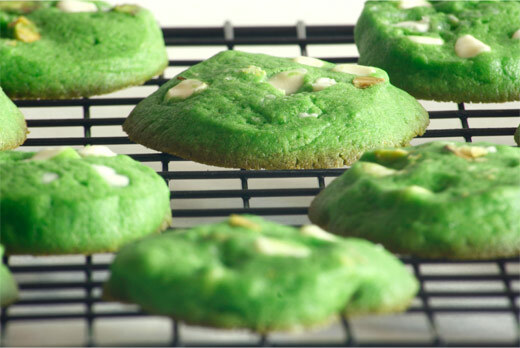 These alien-looking cookies are perfect for Halloween and St. Patrick's Day as well. These are just so pretty, both the green and the pink ones. What a treat for a little girl! those cookies look so awesome. I love anything with pandan. I can imagine the awesome fragrance of your cookies. Lovely pictures. Beautiful. And what a fun treat for the kids. 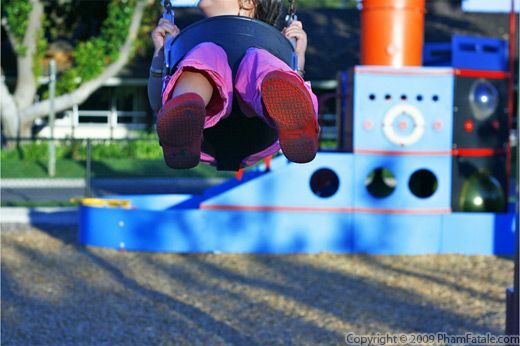 Hey cool swing picture. I have to admit had to go look up Pandan paste to see what you are talking about. Does it impart any flavor to the cookie? Your blog is very enjoyable -lovely photos and some very interesting recipes. I'll be back for another visit. Thank you. Like the cookies, and the color is so vivid...yummie! These would be a fun treat any time. Perfect for St. Patricks Day! These look really nice. I had never thought to make different colour combos. Neat idea. Oh those are so so cute! I love them! So pretty! I have got to get my hands on some pandan. These just may be the prettiest thumbprint cookies I've ever seen! 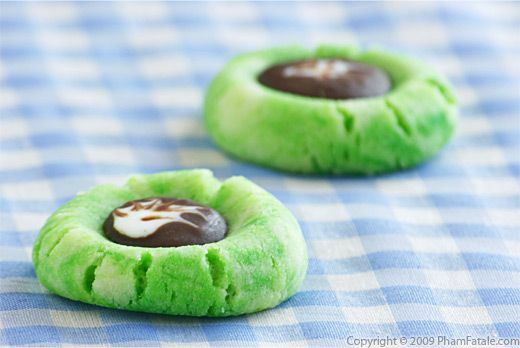 I definitely have to include these in my St. Patrick's Day Sweets roundup on Monday!